The eldership is a very old and wonderful gift of God to his people. This book paints the grand biblical narrative of this office from its beginnings in the Old Testament. Today's church cannot afford to ignore God's instructions for the functioning of this office. It continues to be God's blessing today - but only if understood and enacted according to his pattern. ^^Rooted in the deep soil of Reformed faith and practice, Rediscovering the Elder is also a treasure at a time when much gets lost these days in translation from theory to practice. I heartily recommend this book for current elders, elders-in-training, aspiring elders, and those who seek to be blessed by their labors. ^^Cornelis Van Dam provides a full and intelligent discussion of the biblical texts that inform our understanding of the office of the elder in the church today. This book is a must for those who are elders or who think they might be called to that office. 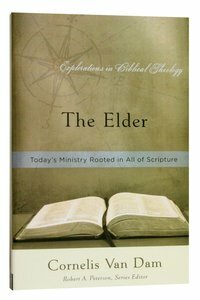 About "The Elder (Explorations In Biblical Theology Series)"
Anointed with the Spirit and Power traces the theme of Holy Spirit empowerment from Genesis to Revelation giving special attention to the Spirit's involvement in the life, ministry, and mission of Jesus Christ.